Data Center Infrastructure Management (DCIM) software is quickly becoming the core engine of data center operations. Only five years ago, manual spreadsheets, sometimes supplemented with Visio diagrams, were accepted as the default tools for data center management. But the arrival of powerful, yet easy-to-use DCIM solutions has resulted in a 40% CAGR growth in DCIM adoption with annual revenue now close to half a billion dollars. Since the IT function is so vital to the success of any modern organization, improving productivity, efficiency and reliability of data center operations deliver an immediate competitive advantage to DCIM adopters. 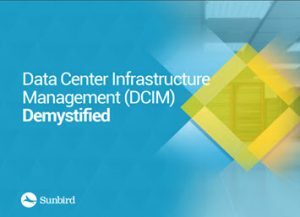 Download the new eBook from Sunbird Software that will offer some facts about why this is so and, if not already the case, why DCIM is clearly in your future.